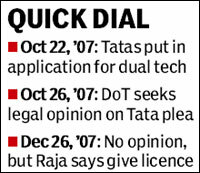 The decision to process the Tatas' October 22, 2007 application for a dual-technology licence before processing 575 other applications received by October 1, 2007 was taken by then telecom minister A Raja without any reference to anyone, and was not part of any existing policy. This is shown by internal documents of the DoT made public in the Justice Shivraj Patil report. On October 26, 2007 – a week after announcing the dual-technology policy on October 19 – K Sridhara, member (technology) in the telecom ministry wrote to the law secretary, asking him to get an opinion from the attorney general or the solicitor general on how to deal with the applications for both UASL licences as well as for dual-technology. On the dual-technology licences to “M/s TATA and others … whether (i) To treat their request prior to existing applications or (ii) To treat their request after processing all 575 applications.” DoT seeking legal opinion is curious, since RCom, HFCL and Shyam Telecom were allotted dual-technology licences a day before the policy was announced. The law ministry suggested the matter be referred to a group of ministers, an internal note on November 2 recorded, and added: “With regard to application of M/s TATA (TTSL and TTML) for dual-technology, it is submitted that since matter is sub-judice in TDSAT, a decision on this may be taken after decision of TDSAT”. A Raja approved this the same day. On December 26, however, Raja wrote to the Prime Minister, informing him the Tata application would be processed as “per policy and guidelines”. It's clear from the internal notes and the request for legal opinion that there was no policy nor guidelines! “An affidavit to this effect will be filed in TDSAT and the Delhi High Court”, Raja told the PM, meaning the policy was going to be created! That this policy was Raja's, and Raja's alone, is brought out by AK Srivastava, deputy director general in the ministry, on January 7, 2008. “The policy of DoT as decided by Hon'ble MOC&IT and communicated to Hon'ble PM vide letter dated 26-11-2007(23/c) shall be treated as policy directive for licensing matters”.